Is The Feature Tree Backwards...........??? DISCLAIMER :- Written after a long day of surfacing followed by quite a few beers! Has anybody ever pondered why the feature tree puts the most recent feature at the bottom of the tree? Yes, I know that SW builds the structure top down on load, but that's just a programming structure that could be changed surely! It's not that it bothers me much at all, but I did wonder why the most recent feature isn't placed at the top of the tree so that you don't have to keep scrolling through the tree to the bottom to reference your latest addition. Re: Is The Feature Tree Backwards...........??? Dave, it's fine for me, but then I AM in the northern hemisphere (and our toilets swirl clockwise). Could be too many beers...but it's better to err on the side of caution, so add more beer. I know you say to forget what we're used to but I think if that change were made engineers all over the world would descend into madness! This forum would be a volcanic eruption of complaints! Remember what happened when SWX changed the icon colors a few years ago? Can't you just use your home and end keys to go to the top and bottom of the feature tree? Saves a lot of scrolling time. OR, perhaps we could ask SWX for the OPTION to display the tree in reverse order. The crap that was pulled with the icon colors in SWX2016 started by making the change and that was it. It wasn't until SP3 (or 4?) where we got the OPTION to use the muted blue or the classic colors that we stopped complaining. I can see the merits of Dave's suggestion, but any implementation should be an option. Dave, please post the ER number so we can add our votes to it. By the way, Tony, thanks for the tip about the home/end keys for scrolling the FMT. I never did lock onto that, but maybe now I will. We could leave it like it is and call it "roots". seems like another option to look for....I can see why you would want new stuff on top. but a global change would have a great learning curve. Turn in a suggestion for a toggle top down or bottom up. Are you trying to br-r-r-r-reak the SolidWorks interweb? Dave while I commend your thought process on this. My thought on it goes the opposite direction. If you were to have this even as an option, would it be global or variable? In other words would an assembly structure also be from the bottom? If so then the expansion would be from the bottom to the to along with individual features at the assembly level. I am not saying this is a good or bad idea, just putting my 2 pennies worth in. If this were to be a global change the premise is a good one, I personally hate scrolling down for the most recent assembly feature(part or inserted assembly). That being said if it was inverted and the trees expanded upward, it is not just a Solidworks flow idea it is a Windows operating system set up as well. You would have a tough time selling the amount of time and programming to go that route for what would feel like backwards flow to every major software. Not saying it couldn't be done, but there is the line of "should it be done". There would also be the issue of hiarchy data parent child relationships and the freeze bar from the bottom. One of the key components to in-context evaluation is a quick reference to the structure of assemblies and parts, which for people working in them is the placement of planes axis and other features relevant to the assembly. When opening an existing in-context file it takes 2 seconds of looking where in the tee things are to evaluate whether it is strong or circular. Re-vamping the history tree would in effect cause ripples of confusion and quite possibly murder.J/K on the last one sort of. Anyhoot the option to turn it on or off is great, but as Dennis Dohogne points out the implementation of "upgrades" like the one you propose usually don't have a limit switch or the ability to turn off. This is where the software just falls flat, I don't care if you change it drastically(Colorblind icons/midpoint selection at the sketch level....sigh). Just leave the option for us to use it the way we want to. Although I do see the Logic behind the question, I think at this point, changing it would be a tough sell for many users. It has been this way since the start, and after using the program for years, I would probably try it just to see and revert back to what is now a work natural flow. My guess is the majority of people would do the same, leaving it used by only a small portion of people. At the end of the day, it may be a waste of SolidWorks development resources that could go to much more functional issues. Just my personal opinion though. I will say, I have never thought of it as backward until now. What you seek is called History. Hide/Show Tree Items: History, Automatic. This folder appears at the top of the tree. It presents actions in the order you describe, with latest at top. However, mine only shows ten entries, which I suppose is the default and may be customizable in Options. In exploring the setting to describe here, I observed something very curious. Recently, while designing in Large Assemblies, I've had History, Bodies, and a couple other Tree Items hidden for less contextually irrelevant things to scroll past. Now, when I re-Showed History, a virtual part which was created since the hiding had no History. The folder was empty when shown. It appears that if History isn't shown or automatic, then it does not monitor, track or accrue. Once re-shown, new actions were recorded as if on a clean slate. This little feature (which is on by default) may even be the cause of some users' reported problems with increasing file size. Hello Dave,.. it's a good question.. options for displaying the feature tree.... it has been brought up over the years. (iirc,.. SolidEdge did something like this?). Is it possible to sort the assembly tree? That started my day with a great laugh! I must say I do like the idea of making it a switchable option as Dennis said, and to be perfectly honest, I wasn't aware that you could utilise the home/end keys for the Feature Tree so that's something that will help, thanks Tony! Definitely going to have a crack at your suggestion too Tom, I wouldn't mind betting that not a lot of people were aware of that one! You are very welcome Dave Bear ! Happy to help Dave Bear. I remember finding that in Essentials I class where I had used it to reverse either alignment or direction of a mate that I had just created, where it was easy to find because it's at the very top of the tree as well as buried within a mates folder of the components below in the tree. "It's always at top, easy to find," I had remarked. The UI was still very new to me, so I was looking for its functions. Also, I searched History in Settings and only got to the Hide/show tree items dialog. I suppose that you cannot expand depth of history easily. Perhaps with a registry hack or some such inadvisable nonsense could make that happen. I wonder if this is something perhaps the wizard Christian Chu could tackle? yes, it can be done but the question: is there a need for this - To list the features/sketches from SW feature manager backward? Christian, a drunken Aussie conceived the need for a backwards tree. Why would you require any more evidence of the worlds need for this to happen? Yep! Display the feature upside down. Most recent at top, but with an option of turning it on or off. Something you could accomplish in your lunch break Christian lol. Maybe it's a fad but I bet if it was created people would use, or at least some! yeah, imho, it is a reasonable request.. and seems simple to do.. I'm surprised someone has not shown a few ER#'s or at least a developer who has created a reverse feature manager? ...Has anybody ever pondered why the feature tree puts the most recent feature at the bottom of the tree? Dave, you guys drive on the wrong side of the road and your cars drivers seat is on the wrong side so I can totally understand why you want this. Why are books written so the most recent word isn't placed at the top of the book so that you don't have to keep scrolling through the document to the bottom to reference your latest words? And while you are at it, Rick, why do cars drive on a parkway and park on a driveway? Why do they call them buildings when they are done? They ought to call them builts! so many questions, so little time... or, do these questions exist because... "they", someone,... or that guy way back when said..%$!$#, and not one person questioned or changed it,..... and, it becomes the "standard"... oh yes, the endless loop of wth? So, Paul, what's the speed of dark? hold on... we will all need to put our my VR googles and fully immerse ourselves into a heavy metal music video and, you're on a luge wearing a tight shiny lycra body suit,... now, close your eyes (yes, close your eyes) and imagine the quantum phenomenon of dark stringy matter tunneling through little itsy bitsy black holes,.. now, quickly open your eyes,.. can you see the light going slower? If you did not see the light going slower,.. you will need to upgrade your VR system to the latest driver from nvidia. oh yes,.. to answer your question.. per Nigel, "1 unit more on the dial". 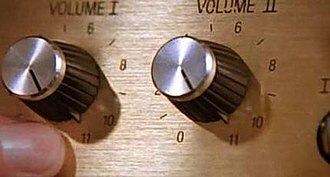 All my dials are set to eleven. ...so, the nescience horizon is getting bigger!... oh, no,... the Darkness!!! Yeah but is that the same if it's pronounced YOOP? An UP unit is actually known as a 'aboveth'. The problem that you would have had in college is the fact that an 'aboveth' is a metric unit that cannot be converted to the imperial system! No, we just got it right first time! oh,.. peasants to the right, eh? "I'm not a pheasant plucker, I'm a pheasant plucker's son! Just repeat it really fast ten times and you'll get the point! Still having PC issues at work huh? The more I think about this, the more I think it has merit. Having said that, I can see pro's and con's too!